Edge used to be quite the internet presence. His website was renowned and even won him the title of Mr Internet Leather one year. He created the 100 Bloggers project and the remarkable Book of Edge. A few years ago, he pretty much dropped off the net, but I have kept in touch with him. He’s been busy with real life, and loves living in Wilton Manors, the gay ghetto of Ft Lauderdale. I met up with him Sunday night at the Leatherwerks Holiday party. He was looking very svelte in his leathers. I was impressed by his weight loss and asked him how he did it. He told me he is not the type to go to a gym and he lost 50 pounds over a year by walking 6 or 7 miles a day. I am so inspired! 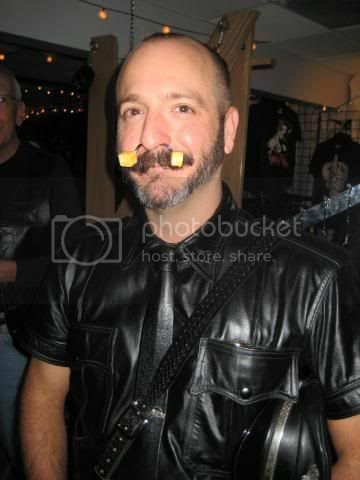 As serious a leatherman as he is, Edge can be silly at times. Doesn’t he make an appetizing hors d’oeuvre? After the party, we headed over to the Ramrod.